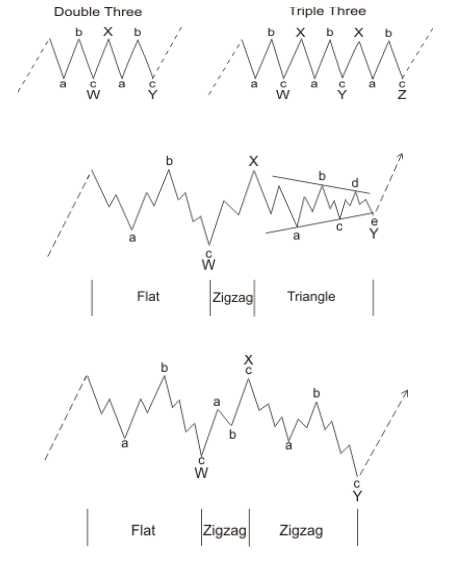 Each of the waves in a complex correction adhere to the basic Elliott structures identified for corrections. That is, Zigzags, Flats, or Triangles. 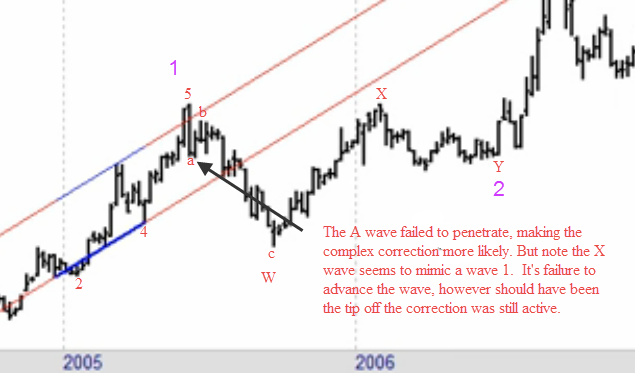 They can occur as the entire correction, being the major ABC waves and done, but they can also occur as a single wave B in the ABC correction. This means you could have a normal A, a double or triple as a wave B, and a normal C wave. A "Double" consists of two ABC corrections joined by the X-wave. These are denoted as A–B–C–X–A–B–C or abbreviated as simply W–X–Y. A double presents itself as a 7 wave corrective structure. A "Triple" is three ABC corrections joined by an X wave between the corrections. These are denoted as A–B–C–X–A–B–C-X-A-B-C or abbreviated as W–X–Y-X-Z. A triple presents itself as a 11 wave corrective structure. Complex corrections are still a part of a larger corrective wave structure and that structure still must adhere to the Wave Rules. As a W4, the complex correction must still not overlap W1. However, this does not mean the expected retracement will be the same as a common W4 pattern, like a Zigzag or Flat. As a general rule, when you see a 3 wave WA, but Wave B does not retrace to near the origin of wave A, you can't call it a flat. But with only 3 waves in A, you can't call it a zigzag either. Therefore, the appropriate label is a WXY. A triangle may still form as WB in one or more of the legs of a complex correction. As shown in the graphic below, when the A wave of a correction fails to breach the wave 2 -4 trend line (even if the entire 3 wave structure adequately retraces the wave or even excessively corrects it) you should expect a complex correction. Note that this chart could represent wave 1 or 3 or 5 of the higher degree, meaning the 2-4 trend line is in the smaller degree wave or those impulse waves. If the A Wave is 3 waves, and the B wave does not come within 90% retracement to the impulse pivot, you can't label it as a zigzag and you can't label it as a flat. It is an ongoing complex correction. Even though the entire wave of a complex correction (eg. Wave 4) must adhere to basic Elliott rules, there is no predictable retracement. You must simply wait for the wave to complete to signify the end of the correction. Don't trade them on purpose. If you find yourself in one, find an appropriate exit point or be prepared to wait out the correction and return to the trend. They provide no known predictive value, although we can predict you will be miserable if you are holding through one of them. A complex correction will first become obvious when your expected movement into the next wave of a correction fails to breakout and instead pivots and reverses. You can then mark the 3 wave structure as Wave X and expect another one or two A,B,C corrections to follow.